Geological Belts, Plate Boundaries and Mineral Deposits in Myanmar arms readers with a comprehensive overview of the geography, geology, mineral potential and tectonic plate activity of Myanmar. 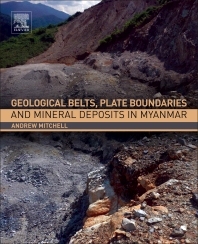 The book focuses on the nature and history of the structural belts and terranes of Myanmar, with particular emphasis on the mineral deposits and their relationship to stratigraphy and structure. The country has a long history of plate tectonic activity, and the most recent plate movements relate to the northward movement of the India plate as it collides with Asia. Both of these are responsible for the earthquakes which frequently occur, making the country a geologically dynamic region. Additionally, Myanmar is rich in mineral and petroleum potential and the site of some of Southeast Asia’s largest faults. However, many geoscientists are only recently becoming familiar with Myanmar due to previous political issues. Some of these barriers have been removed and there is emerging international interest in the geology and mineral deposits of Myanmar. This book collates this essential information in one complete resource. Geological Belts, Plate Boundaries and Mineral Deposits in Myanmar is an essential reference for economic geologists, mineralogists, petroleum geologists, and seismologists, as well as geoscience instructors and students taking related coursework. Andrew Mitchell obtained his D Phil and a DSc from Oxford and has had an international career in geology. From the early 1960’s to the late 1980’s he was an exploration geologist for the then British Service in Vanu Atu, and in Thailand, Myanmar, Nepal, and the Philippines on Colombo Plan and UN projects. After consulting for various minerals companies in Eastern European and Asian countries from 1990 to 1995, he joined Ivanhoe Myanmar and until 2011 was based in Myanmar responsible for the company’s minerals exploration. He has spent more than half of his career in Myanmar and is familiar with the country’s world-class mineral deposits. He has authored or co-authored about 100 papers on tectonics and mineralization. His first book Mineral Deposits and Global Tectonic Settings (Academic Press, 1981) was followed by Epithermal Gold in the Philippines (Academic Press, 1991). An excellent book, full of new information on mineral belts and deposits and on stratigraphy, and with balanced summaries of evolution of ideas on stratigraphy and tectonics.